“Oculus” is a brilliant and eerie nightmare. I walked into “Oculus” expecting to be frightened due to the early acclaim I had heard in the weeks leading up to its release…and frighten me, it did. In fact, its malevolent presence wouldn’t stop haunting me as I drove home, rendering my mouth parched, my lips dry, and my eyes wide open. And to make matters worse — which I believe was the effect “Oculus” sought to achieve — I couldn’t stop thinking about the pure evil I had just seen. If I were to tell you the exact nature of this evil and what you should expect from it, I’d be spoiling the film for you. Rest assured, “Oculus” promises to seize you in a grip you can’t and won’t want to escape, because once the atmospheric scares creep down your spine and penetrate your heart, you’ll be glad to have stayed behind to witness the evil do its handiwork. 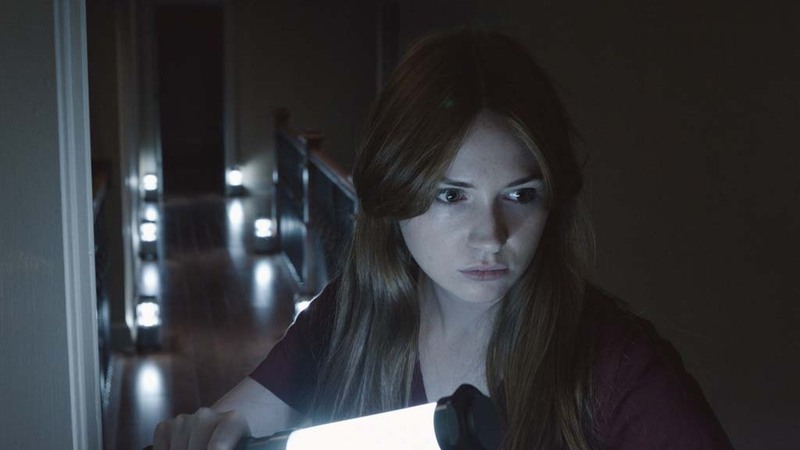 “Oculus” has a simple and effective premise: two siblings, Kaylie (Karen Gillan) and Tim (Brenton Thwaites), are determined to prove that an ominous antique mirror killed their parents when they were kids and also caused misfortune for previous owners. With this premise serving as the foundation of the film, as well as the two leads’ performances, director Mike Flanagan weaves the malevolence of this supernatural horror flick to devastating effect. Gillan and Thwaites, both of whom have great sibling chemistry, anchor this creepy tale. Gillan scores two points for showcasing a resolve to verify her suspicions, and her co-star Thwaites exudes a believable combination of skepticism and reluctance. In addition, “Oculus” benefits from the two leads’ younger counterparts, Annalise Basso and Garrett Ryan, who instill equal amounts curiosity, fear, and love through the portrayal of the child versions of Kaylie and Tim. Supporting players Rory Cochrane and Katee Sackhoff, too, handle themselves quite well in their portrayal of the parents, Alan and Marie, respectively. And because we care for the characters — which I attribute to the well-developed family dynamic — each horrifying revelation strikes with the power of a well-timed trap; the plot is as unpredictable as it is spellbinding. Anticipation builds up (and instills terror in our hearts) as we witness both childhood and young adulthood play out at different points, escalating further as the questions surrounding the family’s antique mirror start receiving upsetting answers. Much of this has to do with the film’s fluid pacing; it neither lingers too long nor rushes ahead to get on with the scary stuff. And where there’s abundant terror, horror is sure to follow in its wake. With an even more shocking impact, the film thereby delivers the goods for genre fans and casual moviegoers alike. Mike Flanagan’s direction manipulates the human senses, distorting our grip on reality as we navigate the insidious confines of the house in which all events occur. Some things appear to be there, and then they’re not, further compelling us to look deeper and therefore become more trapped inside this labyrinthine atmosphere. Finally, once Kaylie and Tim begin to experience frightening things, the awful realization kicks in, carrying with it nightmarish consequences that stick around long enough for audiences to wonder if they are descending into madness. But all these strange happenings are nothing compared to the film’s ending, one that will render the viewer speechless. As tempting as it would be for me to spill the beans, you’re better off experiencing it firsthand. Let me put it this way: if you’re in the mood for a good scare, go see “Oculus,” and be prepared to leave the movie theater the same way I did — with my mouth parched, my lips dried and my eyes wide open.